Thanks, Terry. Those imprints are called “watermarks,” and while they give the copyright holder a feeling of security, they don’t deter Chinese clone shops from helping themselves. They don’t deter others, either, and it is photographers, particularly, who know all about it. Some pirates think we are living in the last days of copyright and they want to get to the New World. Using low-pixel images will certainly deter someone from making a direct giclee from your image, but no technology will stop somebody making a hand copy of anything you put out there. Online stealing is on the rise. Last Friday’s twice-weekly letter was picked up word-for-word by a lady blogger on a well-respected group blog-site. The letter went online, under her own name, minutes after we put it up. Our subscribers tipped us off. With the cooperation of the blog-site, she was dumped in perpetuity. Her creative block got the best of her. On the other hand, when people find the letters useful, we love folks to ask permission to copy or quote for their group, community or print publication. All we ask is a link back so people can directly subscribe if they wish. In the sticky business of reference material, while it’s often difficult to find an author, a straightforward request often gets a “yes.” On the other hand, sometimes you don’t need permission. In a recent commission where I needed a Beaver airplane, I hit Google images and came up with 168,000 of them. I wrote to no one because my painting became an amalgam of many photos. Really, I just needed to know approximately where the windows and struts were. When creative people begin to see that their own imagination is greater than all the world’s theft, true creativity breaks out. Maybe that’s being overly idealistic, but I’m sticking with it. Last year, I received a request from a man in Chagrin Falls, Ohio asking me if he could use an image of a painting done by Alton Tobey (1914-2005) for the background of a diorama he had been working on for the last three years. 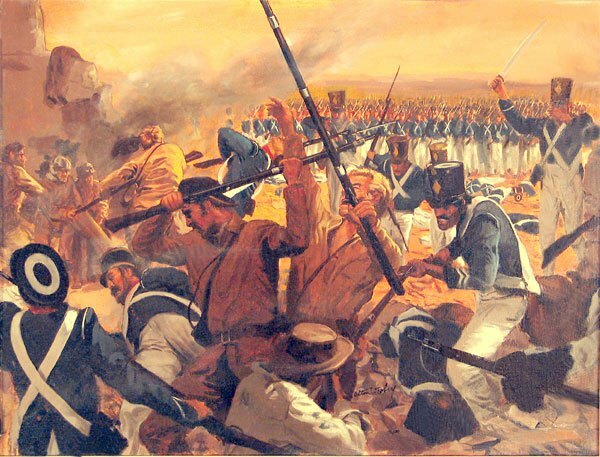 The original painting titled The Battle at the Alamo had been created in 1962/3 by Tobey. It was one of the 350 paintings he had created for a young people’s 12-volume series published as The Golden Books History of The United States. I talked with the late artist’s son and daughter about this and they had no objections. I checked with the book publisher that inherited the rights to the artwork. They didn’t have any objections either, since there was nothing being manufactured or republished that would be in any way for sale. I sent the diorama maker, Tom Munson, a hi-res photo of the painting. He just recently completed the diorama here. Throughout history, controversies over an artist’s work being copied, forged or otherwise being mimicked has always resulted in greater attention to the work of the artists, if only in posterity, and posthumously. So perhaps artists should worry less about these borrowing activities and be more concerned about creating work that is truly great. This letter echoed a recent documentary aired on the CBC Radio 1 show Ideas about copyright and intellectual property. The program was called “Who Owns Ideas?” Although it mainly focused on literal text and music, I couldn’t help but wonder how it transcends into the visual arts world. It seems like we are at a fork in the road; we either have to practice protectionism or be free and open. Although I am not as knowledgeable about the nuances of current copyright law as I was with the next earlier version, it is my understanding that basic ideas cannot be copyrighted. Only expressions of ideas are copyrightable. For instance, there are very few basic fiction plots, but those have been used to create all of the world’s fictional literature. So, except for outright theft, the problem seems to come from the process of derivative work (if you’re trying to create a cartoon mouse, you need to be very, very careful). I am a fine art photographer and have been dealing with this problem for years. Recently an IT guy suggested that I post my high resolution images online with Flash Media. He said that no one can right click and copy the image onto their computer. As a result, it would be impossible to copy or print out the image. This may be the solution. However, when I investigated the software, I found that the cost was around $600! This is totally prohibitive to me. I live in poverty thanks to the fact that I can not post on the information highway that everyone is using to sell their work. It’s a vicious cycle that leaves me on the outside! So, I must return to the old slow way of marketing; continue showing my work and hope a wealthy benefactor notices. There are always service agencies who can post your work for you for a small fee, but don’t think that having work on the internet is going to guarantee you sales. It simply doesn’t work that way. The internet is just one more tool to get your work in front of people who have already heard of you. As one among millions (no exaggeration) it’s nearly impossible to get visitors to your work, unless you have a sophisticated means of driving hits to your website by means of links, etc. Even those who claim to sell enough work to make a handsome living, claim that little or none of those purchases came directly through exposure on the internet. So don’t feel rained on Fred. . . you are not truly on the “outside” except in your perception. Don’t hold your breath for that benefactor either, there are about 5 million artists of all stripes, waiting in line for that one. Actually, make that 10 million. You need to understand that even these websites, with disabled right-click functions, are not going to stop someone from getting a copy of your image if they want it. When someone says they can just take a picture of your screen, they don’t mean with a camera. They mean with the Print Screen button on your keyboard. This does not send a picture of your screen to your printer, it sends a copy of the screen to your computer memory. Then all a person has to do is open a graphics program like MS Paint, which come with your computer and Windows, Paste whatever is in memory and viola, your image shows up on their screen and they can crop it, save it, or do whatever they please with it. We need to either accept that people can do this no matter what we want, or we need to keep our works off the internet. Those are your only two options. I have discovered that when permission to use an image is asked for, it is seldom denied. Further more, some really wonderful relationships can develop from the contact. Case in point, I’m doing a series that required references of bees. I found OBKA on line and asked their permission to use photos from their members’ gallery. Not only did they say yes, but they are very excited about my project. We are negotiating the use of some of my series on their site. What a wonderful opportunity for both of us! I get to show my art to larger audience, and they get to show their much maligned creatures in a positive light. Except when it is a magazine photo. I have written several times to photographers in professional magazines to ask for permission and have been 2 of 3 times denied. My experience with print media is basically the same as that of Ginny in Florida. But I’m not denied, nope; I’m not acknowledged. Once I found a photo of a woman in National Geographic. Wrote NG-no response. Wrote the photographer c/o NG-no response. I took a shot and sent a letter to the woman in her town c/o General Delivery. Immediately I heard from the family — the woman died 2 weeks previously. 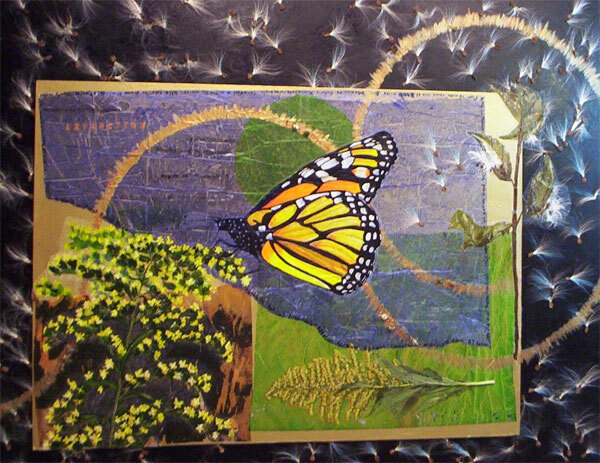 Robin, if you need some bee pictures you should check out your neighbour.. Ive got lots of macro shots of bees, butterflies and other assorted insects..
Love your painting which draws attention to the fact that some of the most beautiful flowers in Ontario are weeds. Think of cardinal flower, chicory, hepatica, trilliums — and on and on. Last fall, a woman from Romania wanted her entry fee back ($30) after her three paintings were rejected from our fall show. The three paintings were exact replicas of Caravaggio’s work. I saw her work and they all were beautifully done. I have to admit that they were far superior to anything in our show. Different cultures have different ideas about what is acceptable and what is not. Her non-refundable entry fee was foreign to her as well. Can’t stop myself. 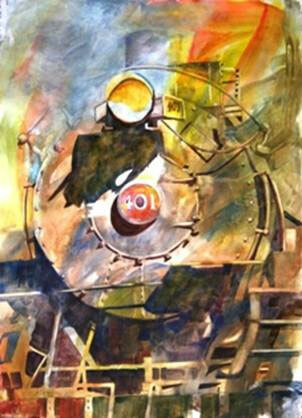 I just have to say beautiful painting of Engine 401. I believe that the majority of artists who protest about the internet theft of art are amateur artists who believe that all of their original art is of value and somehow they are being cheated out of something. The primary value of a piece of art is in the creation of the art itself. No one can steal that. As a matter of fact, if they can make money copying my work, more power to them. I have enough trouble trying to sell it myself. The money is never equal to the joy of creating. Ron: I have to agree whole-heartedly with your feelings. I have just finished a show in which I sold nothing and all I can assume is that I have to do better. Everyone thinks they have just done a Rembrandt, which may not be entirely true!! 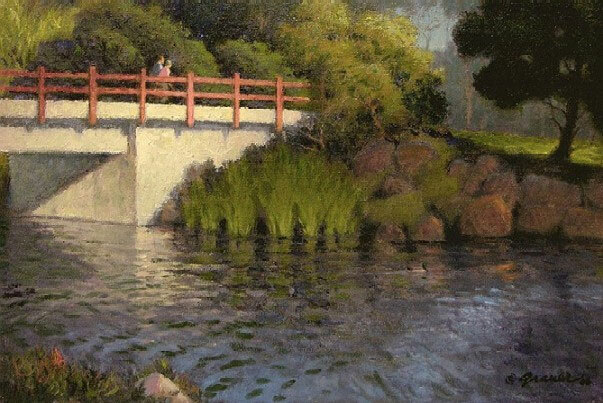 If Bridge on Carpinteria Creek is exemplary of your work, then carry on rewardless. It is a masterpiece in my humble opinion. Ron, Ken, I agree with both of you. Copyrigt laws have gone wildly beyond it’s original intention! Enjoy the experience and whatever someone else does with our work, they’ll eventually pay if it was wrong doing on their part. I’m a strong believer in “We reap what we sow,” and “What goes around comes around,” as well as the proverb, “Lesson of the echo: what you send out comes back to you.” Thanks for your wisdom, Ron! Ron, I don’t know if your assumption is correct, but your words certainly feel as a breath of fresh air. Thank you! Ron, You and I agree TOTALLY. If someone likes my stuff enough to copy all or part of it good for them. I have my own journey and lessons to learn and the last thing I worry about is if someone , out there somewhere is using my work to help themselves progress. There is just way too much narrow-minded EGO going on. Work Hard that’s the answer!! My husband is a writer and I’m an artist. Our biggest nightmare is that a burglar breaks into our house and steals everything EXCEPT his books and my paintings. I realize this is a bit off-subject, but I guess we deep-down feel that we want our art to be valued enough to be stolen? I agree with Ron. If someone takes my work and actually sells it, I want to hire them as an agent. If you have the soul of an artist, never compromise your intellectual integrity. It is dishonest and corrupts the soul of an artist. It will lead you down the path of least resistance. Before you know it, you will do anything to create a painting. This can include stealing, copying, etc. Depend on your self and if you hit a bad streak of creativity and nothing congeals; give yourself a rest and wait for inspiration. Do not compromise to incorporate other works into your work. I am afraid I am a “marginal thief,” but your work is so fantastic — like candy in a candy store — there are moments I can’t resist. I only borrow a phrase now and then for my graduate students to mull over and those are private emails only to my class and I always credit the source. Let me know if I can continue with this blatant thievery for the good of young students who sometimes forget how much the painted image is a part of film making. At the current time I am developing a series of lectures called the seven pillars of film design: creative intuition, researching nature, form & composition, color & light, connectivity, modeling/perspective, and ornamentation. (RG note) Thanks, John. This kind of blatant thievery is welcome. My game is sharing, and so is yours. Please go for it. I’m honoured. I must admit to this kind of thief as well. I am constantly sending copies of parts of this blog to friends for their consideration…very often not artist friends…but ministers or writers or even grandchildren…for their thoughtful consideration. I, too, am guilty. I copy snippets of your letters to send to friends and family members. They’re also pasted all around my easel area as constant reminders and inspiration. I recently benefited from Robert’s quick and gracious permission to quote something from his letters in one of my blogs. What do you think about art shows where they make you sign a legal agreement giving complete copyright ownership to them if you win a purchase award? The legal stuff goes on to say that they completely own it and will reproduce it and the artist gives up all rights to it, etc. I just stopped entering into those shows over the principle of it all. (RG note) Thanks, Sue. There are enough fast operators out there these days to go for one more. You are right to give this show a pass. Those that want you to participate (often to their advantage) in a print deal should be looked at closely as well. Watch out for shows with lots of “purchase awards.” A good rule of thumb is not to participate in anything where the artist is required to pay as well as submit art. Wow! I’ve never heard of that tactic before. I’m glad this issue is being stated here. I would never give up copyright to anyone on anything. If you happen to be lucky enough to get a piece that becomes popular for printing that is income you have lost. You know damn well the promoter will benefit greatly and you won’t see a dime. Read everything you sign and stay away from these types of shows. I am a pancake on that road of computer-induced art. I am a calligrapher, artist and custom picture framer (preservation). I totally understand the concept of woman against machine. The best work I have seen is by hand, those who pasted this life passed to me their customers and confidence to continue from their example. Without them, there was doubt of ability and a dry nib in my pen holder. The new technology is a double-edged sword. While I still don’t have a cell phone, I have a wireless ground phone. I don’t have a DVD player and do own a microwave, I did have a VCR, but now I can’t find tapes to use in it. I don’t have any palm pilots, blackberry, pda’s, I-phones, I-pods, Mp3 players, laptops or any hand held self-scrolling devices and memory storage devices you see advertised on TV (which I do have, equipped with cable) I don’t use any tracking or locating devices for me or my car — of which I have two. I do however have a home computer with an email address and a website. So I’m not too far out on the fringes. I won’t buy into any “game” machines or WII’s. These, to me are a monumental waste of time, especially for an artist. These devices are seductive and are really meant to divert people from the real issues in life whatever they may be to you. With every new device, the danger of theft increases for your personal information as well as your artwork. I am leery of this stuff and avoid it whenever I can. I know there are those who will extol the benefits ad-nausium. But I find these would be a major distraction because they are so seductive with all the bells and whistles and scrolling screens. I think we are slowly losing our individuality and ability to think. We are certainly losing our ability to add simple math equations. I also have an adding machine, which has caused my mind to turn to mush when it comes to addition, subtraction and multiplication. These were never my strong suites anyway but I could navigate thru it. With each new device we travel headlong into an unsure future of the likes of Kurt Vonneget and Gene Roddenberry and Isaac Asimov, a future where we are robotic mal-formed modifications of human beings who won’t be able to paint much less care to. I, thankfully, will be long gone. Leaving intact except of a few teeth and the loss of some hair. I agree, however, we all “steal” as artists or designers. When in college, a very highly regarded landscape architect and guest lecturer gave my wide-eyed class a piece of advice that I’ll always remember…”Use your eyes, plagiarize!” Maybe it’s better to think of it as “borrowing” ideas from others. As someone who wants to use a shipwreck photo I saw online for my inspiration photo for an art quilt to be shown in a 2009 Art Quilt show called “Fragments: Urban Decay”, I can tell you that finding the person to credit and get permission from is proving to be no simple task sometimes, especially when the government is involved. I found the picture I want to do a fragment from on the FWS.org site, and no one can tell me who took it. I have been bounced through 3 news agencies, and 7-8 government/ military agencies with no straight answer yet. I am going to some rather extreme measures to find the photographer and I am now near the point where I have to choose another subject matter if I do not locate the photographer soon. If the FWS doesn’t know where it came from or who took it, how can they be using it legally??? In this case, a watermark would have been a welcome thing to me. I mean really, if government agencies are not bothering to credit copyright owners why should anyone? Perhaps infringement like most corrupted things starts at the top and trickles down…. You really touched a nerve with today’s column. The reason I am not “published” today on the internet is because I’m afraid of someone lifting my work right off the screen and using it for their own profit. So, instead of making a living by my artwork, I still work in a call center doing low-paying, uninteresting work and painting only for my own enjoyment. In what way is one liberated by using the imagination and then having people help themselves to our talent by lifting our paintings off the internet for their own use? I agree with the commenter who said most people using the internet today would prefer to steal other’s thoughts and work than to use their own imagination to create something unique and new for the world to enjoy. I really appreciate your generosity in offering a column of advice and encouragement every week to us artists who are looking for direction and inspiration. Keep up the good work! Recently I was asked to make a pen and ink drawing of an historic home for a tour booklet in a holiday event. When completed I sent the work to the committee chair of my art club with a signature as part of the drawing and a label on the back of the backer board that it was to be used only for this event. Sometime later I picked up a local magazine and found my work illustrating the article with no credit anywhere. When I contacted the publisher he brushed me off with “we only printed what was sent to us” and very patronizingly wished me a Merry Christmas. I spoke to quite a few folks, other artists for this article and etc. and made it clear that I was seeing a lawyer about this abuse of my intellectual property. The person receiving the art has never returned my e-mails and the president of the art club agreed to follow up. Imagine my surprise when I looked at the January issue of this publication wherein there was a half page “thank you” to all the artists from the group who ran the festival. Oh, and yes, they spelled my name wrong. The squeeky hinge gets the grease, but I think “theft of intellectual property” got their attention. Many artists overrate the danger of someone copying their art from the internet. There are so many artists showing their work on line that the odds of a plagiarist seeing yours and copying it are pretty slim. Having said that, there are a couple of ways to protect yourself. First, properly compress your image. Each image should be compressed at its destination size, using jpg compression at the minimum quality at which it is free of visible compression artifacts. This setting will vary from one image to the next. If you do this, it will be impossible for anyone to make a decent print of your image. Chinese copiers are potentially a problem for people selling on line. Some of my colleagues and I at the big auction came up with the plan to put a “free tibet” link on our auctions. The logic was that the Chinese government would block the page, therefore the copy shops wouldn’t see the piece. No one who did this was copied, but they might not have been anyway. As far as I’m concerned, if someone thinks they can paint one of my pictures better than I can, let them try. I can’t believe someone would rather work in a call center than share their work with a worldwide audience and use that advertisement to springboard into a better position over time. Letting fear control your career choice is a sure-fire way not to have the one you want. Harold thanks for the info- the “free Tibet” link is news to me. A transparent top level helps too. Recently I received a email from another artist, a new form of paintings are showing up in the market place. They come from China and the US, from copied work and photos. 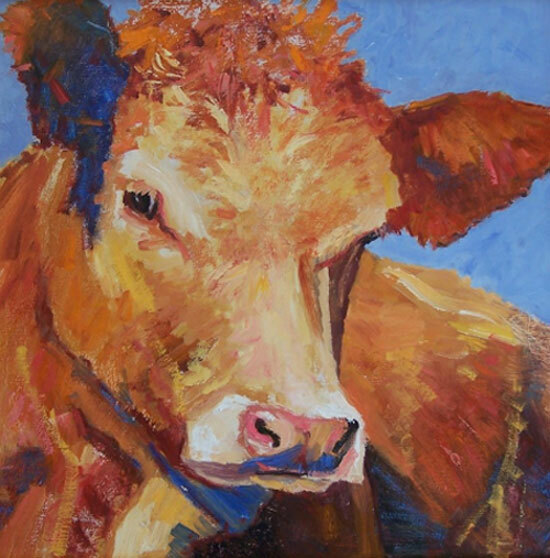 They are oil enhanced giclees, sold as original oil paintings. Also Robert, I am sorry that your letter was stolen. I have occasionally posted your ip address from certain clickbacks to other artists if may pertain to a issue they are having….I always give credit to the painter keys, and take them right to this site…(most are members that don’t read the clickbacks regularly) — do I need permission for this? I thought it would be ok since a link on the top of the clickback page says share this and takes one to other sites. Those in the above letters who believe it’s okay to steal just go to fortify the issue of a lack of morality in America particularly and the world in general. I’ve spoken to this issue before and adapting from others work is very different from copying. I believe we are speaking of copying anothers work and selling it as your own, not using a genre or idea one has seen. i.e. mother and child, people on a beach or the current cityscape craze or copying styles such as impressionism or tonalism. I dare say that many artists work resembles many other artists. This is not copying in the sense we are speaking. If my exact painting shows up stroke for stroke with someone else’s signature, I would consider this copying and an infringement. Lets not confuse source material as stealing. The art comes from interpreting an image and using it in a different way. An example from a recent letter – the artist used a famous artist work ‘as part of her work’, incorporated within her new original piece. The masters work isn’t a copy in any ethical and legal term. As technology advances there will always be those who want to benefit and use it for illicit gain. If youre a thief at heart you will steal, if you are a creative imaginative artist you will possibly have your work copied. Cross every bridge when you come to it. Do your best not to be copied. Prosecute when it happens. But artists cant sit in a room and stack art in the corners. Art needs to be seen and appreciated. When I opened my e-mail and read your topic, “The Problem with Stealing” I immediately yelled at my computer monitor: “The problem with stealing is…IT’S STEALING! !” And some people always will, especially if the chances of being “caught” are minimized and the ease of theft is increased. But character is still defined by what one does when no one is looking and I am yet altruistic enough to believe that the worst way to be “caught” is by one’s own conscience. Of course, there is the very real anguish suffered by any artist, or craftsperson, inventor, even the good cook whose individual works and rewards are stolen. (Remember Rosie Ruiz who stole the accolades at the end of a marathon by “finishing” the race from a starting point towards the end?) Those often irretrievable losses of ownership, revenues and acclaim should not be minimized. To steal creative work violates the artist at the very core of what makes us human. Throughout the centuries, societies have layered on all manner of consequences for such thievery and that defense continues in succeedingly more complex laws, regulations, technologies, not to mention a pandemic of lawyers. Still the clever thief finds a way to steal, sometimes surreptitiously, sometimes just to show he can and increasingly with the blatant gall of someone entitled. And so we are left with the singularly human struggle to stop the thief. To reward good and punish evil. And in that very struggle, should it consume us, the creative process can be subverted by the very effort to protect its product. From such twists of irony, wisdom often emerges. Thank you, Robert, for your always thought-provoking missives! Stealing is stealing and is unethical and immoral. If you can’t look at your subject and/or use your imagination, and create your own art, you aren’t an artist. It’s a pathetic world when one cannot advertise their work on the latest form (internet) without it being pirated. Any bit you stream relies on the receivers morals. On a social scale, journalist and photographers have wedged themselves between society and events while demanding compensation and a strange amount of credit for the event. 100s of bloggers and local news stations plagiarise the Wall Street Journal everyday demanding to be famous. This issue is a can of worms. Also, Anything digital can be lifted. The ArtWanted.com site is in a delusion. The source folder is in the page source or someone can select the image and then copy and paste or screen capture it. Any output can act as an input. Speaking of ‘stealing’, at what point do we speak up and/or report such things that happen right under our noses? I’ve noticed that many artist friends of mine have no hesitation in bringing their soon-to-be award winning paintings to a critique group for help and advice. This is done regardless of criteria which states ‘no class work’. Isn’t a critique group in violation of the idea that contest work is an independent creation? I have put very hard to see lettering across the works on my website, but I thought if anyone wants to copy my paintings and make prints of them for sale, as long as they left my signature on them it still might be good advertising. I can’t afford to sue them. Yes, there is no way to stop this mystery called Technology” that we have created and sadly nor can we stop the ugliness that accompanies it. Two things though. As a writer, it is just as difficult to attend a function and hear your own work being read and attributed to someone else. At first, I couldn’t believe my ears because the person knew well that I had written that work. Then I became inwardly upset for the moment. Now, my second point and this is where your “being idealistic” comes in. It was not long before people started coming up to me and saying, “You wrote that, didn’t you?” I did not have to say a word. People already knew my work and I did not have to claim it. So, like you, I am sticking to being “overly idealistic” too. It works ! We better get used to it. It is some quirk in human nature, and has been since the beginning. Some people’s value systems are dysfunctional, and they ask, “What can I get away with?” I also suspect there is some truth in the saying “imitation is the sincerest form of flattery”. Of note is the classical European artist training of years not so far back. I saw this first hand in the Louvre. Young students and artists learning were copying the masters’ paintings — replicating them as precisely as possible. This accuracy in COPYING was what they were graded on. There are always stealers and liars — have been since the beginning. Animals do it. Humans do it. Bugs do it. Doesn’t make it right for those of us with scruples. But it will always be. You wanna copy my paintings — go ahead. By the time you do, I am onto another level and am propelling my life forward as an artist. As the French say, the more things change the more they stay the same. Voila. Get used to it. Once you are on the net you are out there. You can try to protect yourself as best as you can with low level pixels etc, but the technology to override that is there, being used and that is that. If the image is too precious to you , don’t put it on the web. A small, but significant way to protect yourself is copyright registration. You can cover a large number of images with one registration. Read the instructions carefully and follow them. You have a better leg to stand on, should somebody rip you off big time. But remember the way most law is applied these days, everything is “alleged” till proven in court. That may mean you have to sue and the solving of the matter may take years, and horrendous amounts of money. Most artists don’t fall in that category. One small way every artist can help is if you belong to an art organization insist, nicely, but steadily that they follow copyright rules, are familiar with them (you won’t believe, how many organizations and artists have totally unrealistic ideas about copyright or don’t think it matters much) and respect each others work. It starts at home, as do so many things. Every organization should have rules about copying and derivatives in their shows and have straight forward ways to enforce them. do overlay a semi transparent “© my name” on my images. I am not so naive to think that this will protect it from anyone who is determined to copy or print it, though it might give pause to those who are on the fence. However, the other reason I do this is because of the “help yourself” attitude that is rampant especially in the blogosphere. I constantly find bloggers using my images to decorate blogs that have nothing to do with either me or art in general, without ever asking for my permission to do so. I think most people who do this are finding my images through Google image search, and hotlinking to them without another thought — no name credit or link back to my site. So not only are they using my image but they are also stealing my bandwidth. I try and put a stop to this practice when I run across it, but frankly I just don’t have the time to police the WWW. So I add my name credit on the front end and just consider it free advertising. I joined Facebook 2 months ago and was amazed at the “sharing” of other artists’ and photographers’ work without giving them credit for it. So I posted this comment- “Sandy is wondering about people posting copyrighted images without crediting the artist.” I opened up a real can of worms! I have used online images to find a picture of a bird or animal to use in a painting that called for a living thing to give it some pizzaz. I have felt guilty, but did not copy exactly..I just needed to be sure that I knew the structure well enough to portray the bird/animal so that it was at least recognizable. However, when seeing a painting that I loved, but could not possibly afford, I did paint a copy (as close as I am technically able) to hang on my wall. I would never attempt to sell, or not let anyone know that it was a copy of the particular artist. Was this illegal? Am I a thief? I’ve shown artists how the watermarks can be removed by those who want to use works without consent; however, watermarks can be put on images in ways to make removing them as nuisance. Additionally, images should be posted or e-mailed which cannot be enlarged without moire and/or pixelation. If someone wants to steal others’ works, they’re sure going to do so, unless the artist/photographer takes the time to make doing so difficult. As far as text is concerned – that’s a problem which has been in existence as long as mankind has been using written communication. If the works are copyrighted and it can be proven they were originally used by the writer, then there is good grounds for going after the plagiarizer- civilly and criminally. Recently someone who loves me gave me a present which they stole. They said – it was just lying around and it’s a perfect thing for you. I was amazed because this person has the same moral values as I, but justified the theft by its low value and love for me. I know several people with which I worked for years and got to know them quite well, and gained respect for their ethics – then every once in a while one of those people steals someone else’s work, doesn’t give due credit, or parasites of someone else’s work. How does that transition from honesty to dishonesty and back work? Stealing. I have done it. I was nine years old. I plagiarized. After I did it, I felt awful. Of course, Mrs. Lamb (my third grade teacher) found me out. She handled it beautifully. Privately, she confronted me after school and gave me a chance to admit what I had done. The admission felt SO GOOD! I cried and after Mrs. Lamb gave me a little hug, she gave me a little lecture. I don’t remember what she said but I do remember feeling tremendously relieved. The most valuable part of this lesson was at an early age, I got to experience how terrible it feels to be unoriginal! Instead of using other people’s words, other composers’ melodies, other artists’ images, I learned to study them, to value their work and to set a standard for my originality. The complete joy of creation came forward for me on that day. I was given a chance to rewrite the assignment, rather than being admonished, shamed and given a failing grade. I never worked so hard! I wrote a beautiful story about an artist who couldn’t find her painting. She looked everywhere, asked everyone she knew. After exhausting her resources, she looked inside herself and there it was! It hurts when someone steals from us. My home has been robbed. My car has been stolen. My ideas have been presented before groups of people and ownership claimed by the thief. It happens and it doesn’t feel good. We get to choose our behavior. I have an understanding of how it feels to steal. There lurks a dark force like self-doubt or anger or fear inside the thief. Although this might explain the choice to claim something that doesn’t rightfully belong to him, it doesn’t make him any less of a swindler. Mrs. Lamb was a wonderful role model. Because of her, I’m not afraid to confront someone who steals. I’m not above forgiveness. The reason? Because I know I’m the original. There is one solution to stealing. My stuff is so labor intensive that nobody but an idiot would bother copying it! Ansgard Thomson – Suggest to them that you paint directly on the wall. The thieves would have to chip off the plaster to get your work. I can’t believe you sitting IN the snow painting. Wow. Really. Wow. 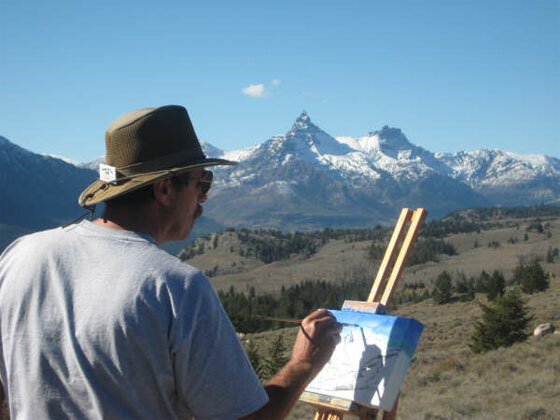 There should be some kind of plein air award for dedication like that. And there must be some kind of special problems you must deal with – frozen brushes, icy paint water, stiff fingers. Maybe artists really ARE nuts. And at the same time, boy, you got the life. Paint on. I like the idea that you are painting outdoors up at Whistler right now but how do you deal with keeping your paint from freezing? 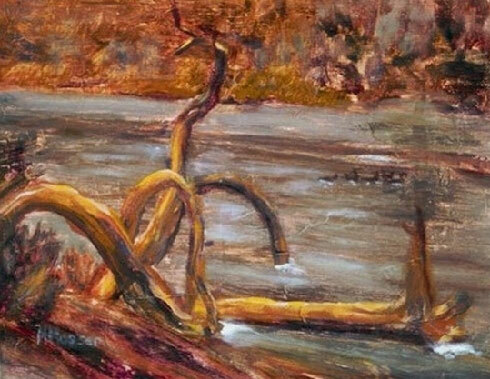 I used to paint in acrylics until the cold weather froze every tube. I had to buy all new paint. Now I paint with oils and I don’t have to worry about it freezing up on me. Regarding artists stealing other artists’ work. I have to say I’ve observe a copy of an internationally recognized watercolor artist work in a juried competition. It even received First Place and this credential led to the copier receiving her Signature Membership. Not only that, this same person was on the board for the organization. Talk about being stuck between a rock and a hard place, I just left the matter alone, and hope the ‘thief’ knows deep inside her winnings weren’t honestly won and she lost my respect. A few years ago, I had a painting stolen from a gallery, I was new to galleries at that time. Nine paintings were stolen all together. The agent called all of us. She said some were crying and felt violated etc. When she got to me, the only thing I felt was, some body liked my painting. And I asked her if she called the media for the publicity. She thought that was a good idea, and the next day a nice article about the gallery and the artists appeared in the paper. A few days later we offered a reward so we got two very nice articles in the paper. I’m all about the process. I had the fun of making that art and taking a very good photo of it. When I do that it is very easy to let go. I have also had many teachers get in touch with me from all over the world, asking if they could use my African art work for their classes. This thrills me. I am never going to be an artist who can make a living off her art, but if I get another artist excited enough to explore, I am fully rewarded. The upside of an online gallery is the virtually unlimited viral audience; the downside is the loss of control – images can (and will) get pulled off of websites and redistributed via email and blogs, regardless of intent (worst case: theft/willful misappropriation; best case: enthusiasm/sharing.) watermarking is a feeble deterrent at best for the former- where there’s a will, there’s a way – but in the case of the latter, it’s added ‘credit insurance’ as the image passes thru cyberspace. why not take advantage? I thought the highest form of flattery was a check! Why not go with the flow. I make no attempt to stop my images from being copied. In fact, I have a standing offer to send a high res image to anyone who asks on condition that they don’t use it for profit and make an attribution. No way to inforce this, but most are honest. I’d like nothing better than for large numbers of art lovers to print out my work and display it on a wall or as wallpaper on the computer.